Alcala is the city of the storks!! Storks in Alcala de Henares. The number of white storks in Alcala de Henares is increasing every year. It is increasing so much that, nowadays, they are one of the tourist attractions of our city. 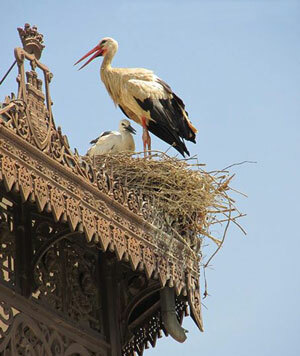 How many storks are there in Alcala? More than you can imagine!! Alcalá seems empty right now. It’s the end of September, and the city is busy enough with the children heading back to school and the general population returning from their summer vacations on the sun-kissed beaches of southern Spain. The monuments are steadily anchored in their places, but a sense of disorder prevails. It could be the thick air caused by a lack of rain, or the strange fluctuating temperature brought about by the change of seasons. No…it’s not that. Looking up at the historic skyline of Alcalá, I can see all of the giant nests, well-preserved and vacant. Their awkward inhabitants have left the city until mid-autumn for their own sort of vacation. Yes, it is the storks that are missing. Alcalá is well-known for its white stork population, which accounts for 10% of the birds residing in the Community of Madrid. There are approximately 90 breeding pairs that arrive in mid- to late autumn to raise their clutches.Every year, the city does a census of the birds, and it also makes sure these feathered citizens are looked after appropriately to their needs; which includes providing them with an easy-to-reach special supply of twigs and branches for their nests, as well as making sure they suffer as few disturbances as possible. This seems a vain task in one of the largest urban areas in the Community outside of the capitol. 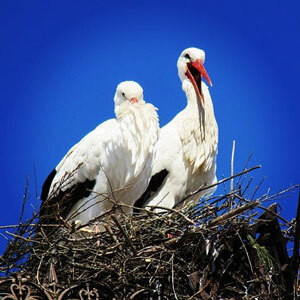 The white stork is protected in Spain, and Alcalá wants to preserve its population as best it can. 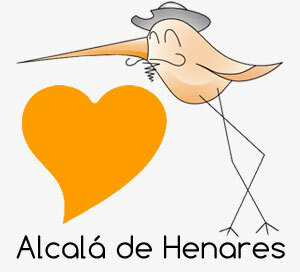 When to see storks in Alcala de Henares? Between mid-October and the beginning of August, you can pretty much see a stork on every tower or historical building in the city. You also can hear them snapping their beaks like castanets, and every so often, a twig falls from the sky. Alcalá is the city of the storks; Madrid has a bear, we have storks. Traditionally, the storks would migrate to Africa at this time of year, but their period of migration is getting shorter and shorter. Now they stay in Spain almost the whole year, if you don’t see them in the city, they are probably taking the country air just a few kilometers away. It is thanks to modern conveniences like the dump, which provides them with a constant food source, that the storks no longer make their way south for the winter. Spain’s rather mild winter climate is an added bonus. If you want to experience the city of the storks, you don’t have to look very far. The Concejalía de Medio Ambiente in Alcalá has created a self-guided tour that combines stork spotting and the viewing of the historic sites of the city. It can be found at the website of the Ayuntamiento. This is also a wonderful place to find out the basic information about these prized inhabitants of the city (in Spanish, of course). P.S. 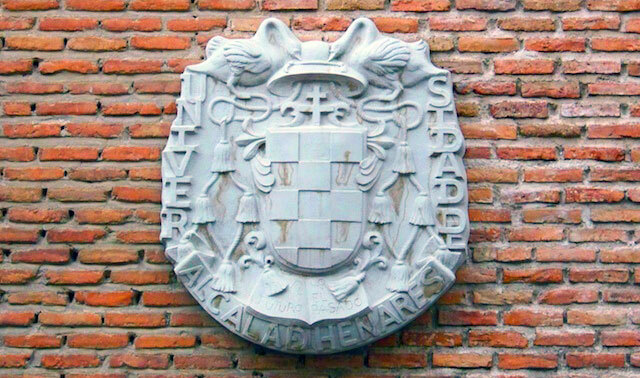 : If you have seen the coat of arms of the University of Alcalá, don’t be mislead, those are swans or ‘cisnes’, not storks. They are there because the founder of the University was named ‘Cisneros’ and he loved ‘cisnes’. Here at Alcalá Now, we think they look like storks, making Alcalá even cooler! Only smart asses think these look like swans. What are the best places to visit in Alcala de Henares? These are our favourites! 2 Responses to Alcala is the city of the storks!! Storks in Alcala de Henares. Amazing, I wish we could see them, maybe one day…. This year we were in Madrid but I didn’t know the storks were so near. I love storks and have taken hundreds of photos of them all over Europe and in Turkey. Is there a live web cam so that I can see them often? I only just found out from a tv programme here in the UK called Natures Wild Cities.